Though with every passing year the number of emoji oversights grows smaller, this year marks a major milestone in the area of hair representation. Users with red hair can finally use an emoji sporting their natural hair color – this addition joins options for curly hair, white hair, and no hair. Each of these variations is available across the full set of skin existing tones. 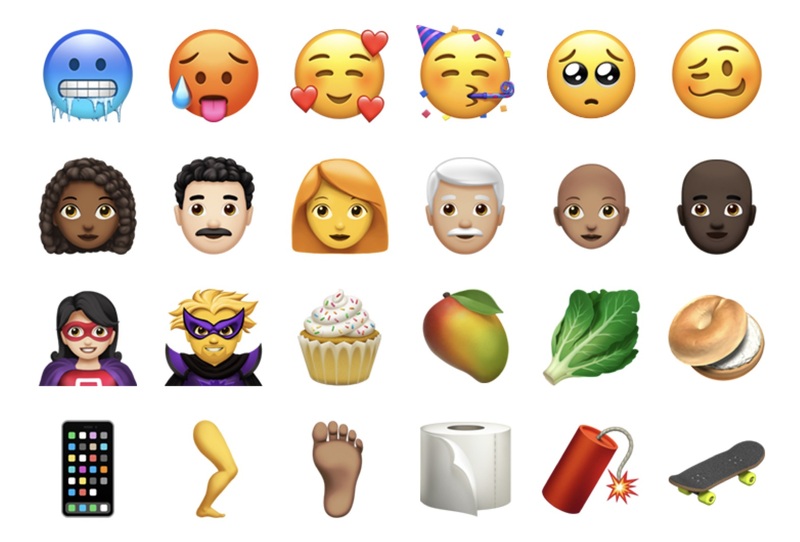 Outside of new hair options, iOS 12.1 introduces emoji for superhero and supervillain, bagel, mango, badger, kangaroo, teddy bear, a leg, and much more. A few of my personal favorites include the new partying face, smiling face with hearts, cold face, and pleading face. Following the introduction of the iPhone X last year, and a full lineup of X-inspired devices this fall, Apple has also updated the smartphone emoji in iOS 12.1 to show a bezel-free iPhone design. Fortunately for us all, they've refrained from highlighting the notch, hiding it by keeping the top area of the display solid black. 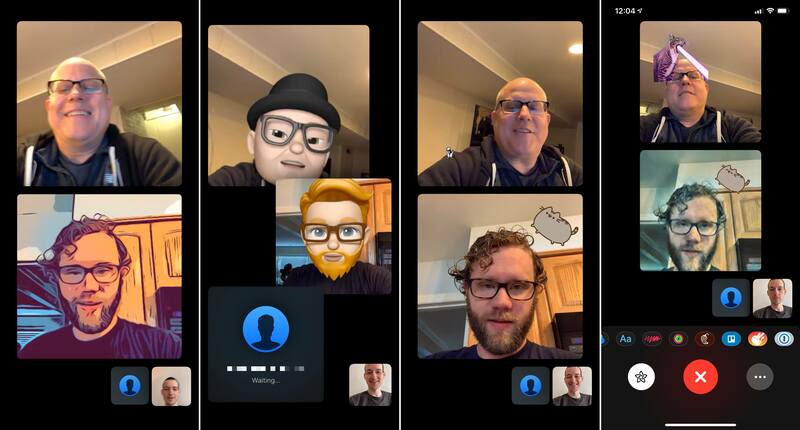 Originally announced and beta tested as part of iOS 12.0, Group FaceTime saw a slight delay that pushed it back into iOS 12.1. Now that it's here though, it works just as originally expected. Group FaceTime enables video or audio calls between up to 32 people at once. When initiating a new group call, the FaceTime app enables adding multiple contacts at once then choosing whether to start an audio or video call. If you're already in a call and would like to add more participants, that's easy too. Simply hit the '...' button near the bottom of the screen, then tap 'Add Person' and search to find the person you want to add. In order to add multiple participants, each person needs to be running iOS 12.1. If some of your contacts are on an older release of iOS, their name will remain grayed out and you'll be unable to select them for group calls; if a contact is listed in blue, however, you know they're running the latest software and can thus be added to a group call. One new iPhone camera trick highlighted during Apple's September keynote this year was the ability to adjust the level of background blur in Portrait mode shots. Once a Portrait photo is saved in your library, this depth control feature can be accessed from Photos' edit mode. Once the editing interface is loaded, you'll see a new horizontal slider lining the bottom of the screen – by default it sits at f/4.5 for the standard amount of background blur, but you can also adjust it from a max blur of f/1.4 all the way down to f/16. Depth control was previously available in iOS 12 on compatible iPhones, but what's new in 12.1 is that the iPhone XS, XS Max, and XR can now perform depth adjustments live in the camera's viewfinder before a photo's even been taken. To bring up the depth control slider inside Camera, tap the new 'f' icon in the upper right corner, then adjust to your heart's content and see in real-time what the finished product will look like. In other words, yes skin smoothing was a real phenomenon, but it was unintentional and only applied in certain situations. And it's fixed now. One new feature of the iPhone XS, XS Max, and XR is that each device offers dual SIM support. In addition to the built-in physical SIM, as of iOS 12.1 you can add a second line to your phone via an eSIM. To set up a cellular plan via eSIM, your device has to first be unlocked, after which you can visit Settings ⇾ Cellular ⇾ Add Cellular Plan and follow the steps from there to set up your second line. iOS 12.1 marks a significant accomplishment in that it completes the public release of every previously-announced iOS 12 feature. 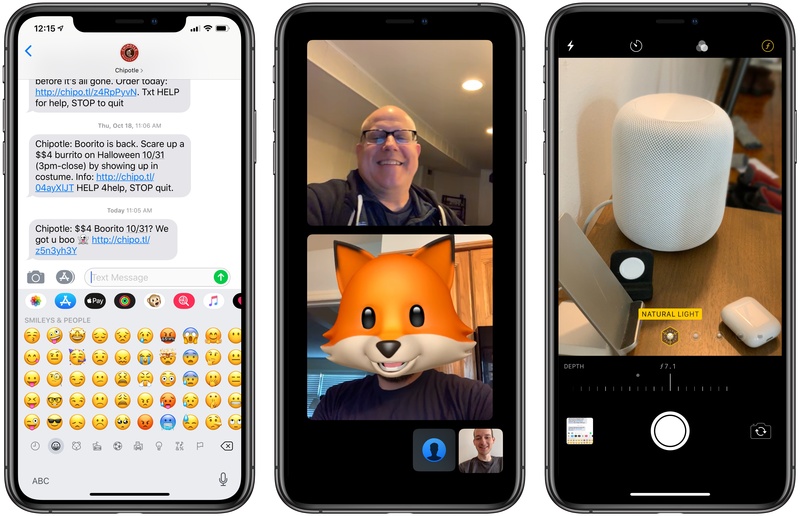 Group FaceTime was announced and demoed at WWDC, while new emoji debuted on World Emoji Day, and neither of them had us waiting past the fall for their release. This is in stark contrast to iOS 11's release cycle, which was plagued by delays. Major features like AirPlay 2 and Messages in iCloud didn't arrive until iOS 11.4, nearly a year after they were announced. Now that everything we know about iOS 12 is available in our hands, it will be exciting to see what the company has in store for future updates, such as the presumptive 12.2 and 12.3.